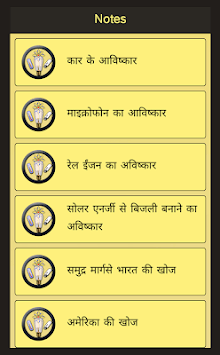 Discovery and Invention (खोज एवं आविष्कार‌, जनक एवं संस्थापक) application provide knowledge about Discovery and Invention of various things in Hindi Language. This application helpful to students and other people who are preparing for government entrance exams. 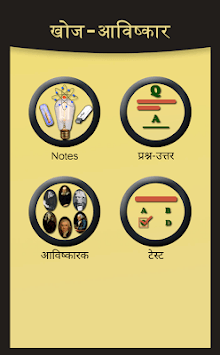 Read and practice various topics of Discovery and Invention and increase knowledge using this application. # Notes - Read various topics in detail. # Q&A(प्रश्न - उत्तर ) : Read important questions and its answer(Q&A) in set wise. 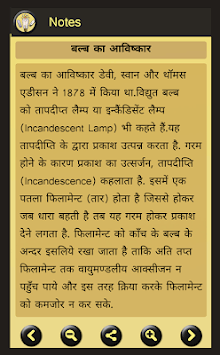 # Inventor(आविष्कारक) : Read about scientist and its invention. #Quiz (टेस्ट ) - Practice various questions with different options(Only for preparation). * Beautiful,Easy and user friendly interface. * All Content provided in Hindi Language so easy to read and understand. All type of content present in this application is collected from different sources also do not provide any kind of guarantee.If there is any issue or violates your any type of rights please send us email at “[email protected]”.